ADAM Software™ Integrates ConceptShare OEM To Create ADAM Collaboration, An Extensive Yet Easy-To-Use Cross-Media Annotation, Proofing And Approval Studio Tool For Use With All Rich-Media File Types. We'll be happy to show you how ConceptShare and ADAM Software work together to streamline your marketing operations. 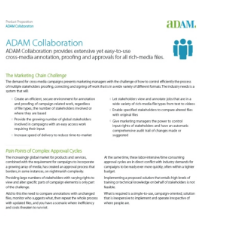 ADAM Collaboration meets industry demands for cross-media campaigns by allowing multiple stakeholders to proof, correct and sign off on work in a wide variety of different formats. Collaboration includes ADAM’s robust security and full integration with other ADAM marketing solutions such as ADAM Workflow Studio and DocMaker. Centralizes control of all processes during campaign approvals. Simplifies approvals for fewer errors, faster turnarounds, and less stakeholder frustration. Entire collaboration, annotation and approval cycle can be embedded within other business processes. Provides quick ad hoc approval cycles with the flexibility to obtain opinions as well as approvals. Easy-to-use yet powerful annotation/proofing tool encourages stakeholder involvement in approval cycles. Increases marketing communication efficiency, agility and security, leading to fewer delays and greater accuracy. Helps meet deadlines with fast sign off for different elements. Mobile UI to approve/reject projects on any smartphone. Easy-to-use interface requires no additional training. Easy set up of individuals, groups and guests in workflows. All processes can fully integrate with ADAM Workflow and other collaboration tools. Easy to compare edited files with their originals. Full reviews of current and archived projects. Stakeholders can collaborate in parallel or in sequence. API allows ADAM Partners/customers to extend Teamwork. Product Sheet - ADAM Collaboration provides extensive yet easy-to-use cross-media annotation, proofing and approvals for all rich-media files.